According to an official from Beijing Municipal Gardening and Greening Bureau, during the 7th Expo, the Harbor will undertake the task of showcasing Beijing's industrial parks as well as the outdoor flowers of enterprises. After the 7th Expo, the Harbor will gradually become the center of flower production, research and development, exposition and trade in Beijing, as well as a center for recreation and the cultural exchange relating to flowers. Li Zaidong, deputy director of the management committee of Beijing International Flowers Harbor, revealed that as the largest comprehensive flower industry base in northern China, the Harbor is located in the town of Yangzhen in Shunyi District, with planned area of 4 square kilometers. The Harbor is the largest “garden” planned by Beijing Municipality and, and has been listed as one of the city’s key projects since its construction began in 2007. “Some of the flowers Beijing is going to exhibit at the 7th Expo will be produced here,” Li said, adding that construction of the Harbor’s main body will be completed at the end of this June and the Harbor is expected to open to the public in the first ten days of September. By then, Beijing will celebrate its first chrysanthemum festival, which will be a warm-up event for the 7th China Flower Expo. 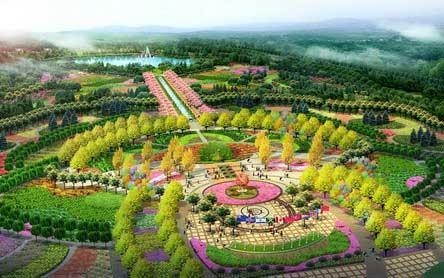 Li said that the Harbor will hold annual themed flower shows in spring and fall from this year on. The spring flower show will have a tulip theme. According to initial estimations, the Harbor will directly generate between 500 and 600 jobs, including parking lot fee collectors and workers for the 100 solar greenhouses as well as workers for the industry base.